Tularemia is a bacterial disease of humans and animals caused by the bacteria Francisella tularensis. Although many types of household, farm, and wild animals (especially rabbits, hares, muskrats, and beavers) can be infected, tularemia is most often spread to people from infected wild rabbits. Tularemia is not known to be present in Hawaii. The bacteria occur naturally worldwide and could also be used as a bioterrorist weapon. The symptoms of tularemia vary by the route of infection. Initial signs are often flu-like, including fever, chills, nausea, headache, and joint pain. When tularemia is spread through a scratch or bite, a sore may appear at the site where the bacteria entered the body, and lymph nodes near the site may be swollen and painful. Swallowing the bacteria in food or water may cause sore throat, stomach pain, diarrhea, and vomiting. Inhaling the bacteria can produce fever, coughing, chest pain, shortness of breath, and a pneumonia-like illness. 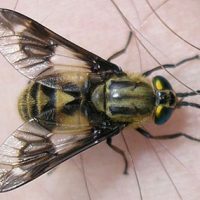 People can become infected with tularemia by direct contact (through mucous membranes of the eyes, nose, and mouth, or cuts in the skin) with infected animals, inhaling the bacteria from contaminated environments, eating or drinking contaminated food or water, or by the bite from an infected insect, such as a tick or deerfly. Tularemia is not spread from person to person, so people with tularemia do not need to be isolated. 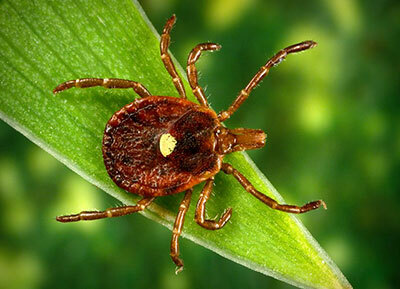 The symptoms of Tularemia are similar to many common illnesses. 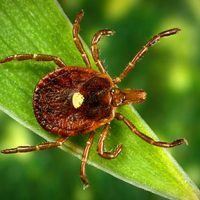 It is essential that you share with your physician any illness following exposure to sick or dead animals or bites from ticks or deer flies in areas endemic for the disease so that he or she can ordered the appropriate diagnostic tests. People should be treated as soon as possible at the first sign of illness with the right antibiotics prescribed by physicians, or it can be fatal. Tell the physician if you have had contact with wildlife or the environment in an area where tularemia has been diagnosed. Also tell the doctor if you are pregnant or have a weakened immune system. There is no licensed vaccine available in the United States. Those that recover from a natural infection usually have long lasting immunity. Tularemia is not known to be present in Hawaii. Avoid contact with wildlife, especially if they appear ill. If you must handle wildlife, wear gloves and wash your hands after touching any animal. Wear protective gear (rubber gloves, goggles) when skinning or handling wild animals, such as rabbits, in areas where tularemia is found. Thoroughly cook wild game meats before eating. Wash fruits and vegetables before eating. Wear insect repellents and protective clothing to prevent bites of flies, ticks and mosquitoes in areas where tularemia is reported. Only drink from, and swim at, safe water sources. Tularemia is an URGENT notifiable condition and must be reported by phone to the Disease Outbreak Control Division, Disease Investigation Branch on Oahu, or to the District Health Office on the neighbor islands as soon as a provisional diagnosis is established.